PrintVenue is one of the greatest personalization online store in India. You can find best personalized merchandize at PrintVenue website. Their collection include wide range of commercial and consumer products. Their product list is endless. Some of their popular products are business cards, card holders, parker/cross pens, pen drives, wallets, mugs and mobile cases/skins. You can personalize all their products with your name, text and pictures. There are 1000+ design templates which cater to your tastes and preferences. PrintVenue.com delivers across India, including major cities like Delhi, Noida, Gurgaon, Faridabad, Ghaziabad, Bangalore, Chandigarh, Chennai, Hyderabad, Indore, Jaipur, Bhopal, Kolkata, Mysore, Udaipur, Patna, Surat, Jalandhar, Lucknow, Mumbai, Navi Mumbai, Nagpur, Pune, Ahmedabad, Cochin, and many other parts of India. PrintVenue has come up with 3 exciting offers for October 2015. This is a limited time offer. So, hurry up. PrintVenue Offer 1 - Get 150 off on a minimum purchase of Rs.299 when you download the PrintVenue App. 1. Download the PrintVenue app from here. 2. Buy products worth Rs.299 or more. 3. 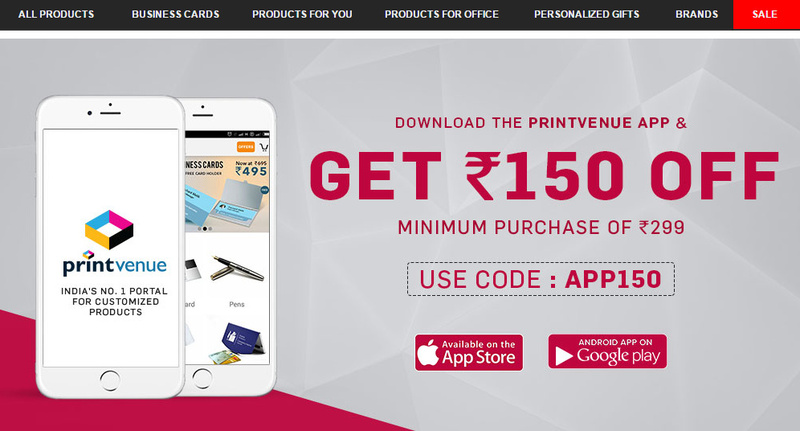 Apply the Printvenue offer code 'APP150' to get Rs.150 off. 1. PrintVenue's terms and conditions are applicable. 2. Minimum purchase is Rs.299. 3. Offer is flat Rs.150 off. PrintVenue Offer 2 - Flat 50% off on your first order. How to avail PrintVenue Flat 50% offer? 2. Register if you are a new user. If you are an existing user, this should be your first purchase. 3. Shop the products you desire. 4. Apply the coupon code 'FIRST50' to get flat 50% offer on your order. Note: PrintVenue's terms and conditions are applicable. PrintVenue Offer 3 - Rs.100 off on mobile cases. 2. Shop mobile cases / mobile skins. 3. Apply voucher code 'MOBILE100' to get Rs.100 off.